Disclosure: My cousin received the Dinosaur Escape game from Peaceable Kingdom for review. All opinions are her own. My kids love board games. We have so many, yet they still want more! They never have enough. So I was thrilled to receive Dinosaur Escape game, because it is a game that my two kids (ages 3 and 6) can both enjoy. It is designed for ages 4+ but my 3 year old did just fine with his big sister there to guide him. After they had played Dinosaur Escape together two times, my mom came over the next day to hang out with my son while my daughter was at school. My son said he wanted to play the game with his grandma, so she sat down with him. I was watching and listening to them, and I could not believe what a great job my three year old was doing at explaining the rules of the game to his grandmother. It really amazed me at how well he was able to teach my mom the steps of the game, especially considering that we haven’t had this game very long. Dinosaur Escape is designed for 2-4 players, which is perfect because they can use it alone, or when friends come over. My favorite thing about Dinosaur Escape game is that it’s cooperative, which means there’s no ‘winner’ and ‘loser’, because everyone is working together towards the same end goal. This is a winner in my book, because there is no potential for drama. The other thing I love about this game from Peacable Kingdom is that it doesn’t take very long to play. It was getting close to bedtime, and my daughter announced that she wanted to play the new game again, and I didn’t have to say no, because I knew it wouldn’t impact us too much with getting to bed on time. My biggest challenge with the kids playing this game is keeping their one year old sister away from them, because the game has tiny pieces. It comes with three dinosaurs that are used as the movers during the game. Players pick up fern tokens and roll the die to work together to build a 3-D volcano puzzle and to get their dinosaurs to Dinosaur Island. I think that Dinosaur Escape game will definitely be one of the more frequently played games that we own. My son gets frustrated with a lot of other games, because they require reading during game play, and he’s not reading yet, so Dinosaur Escape is wonderful for him since it doesn’t require any reading. I was super excited to see that I can contact Peaceable Kingdom for free replacements of lost or broken pieces. This is an awesome policy. In my house, lost or broken pieces are inevitable, so it’s really nice to know that the game won’t be trash just because we can’t play without the one piece which we cannot find. I will definitely look to Peaceable Kingdom next time I’m looking for a new board game for the kids, or for a birthday gift for a friend! 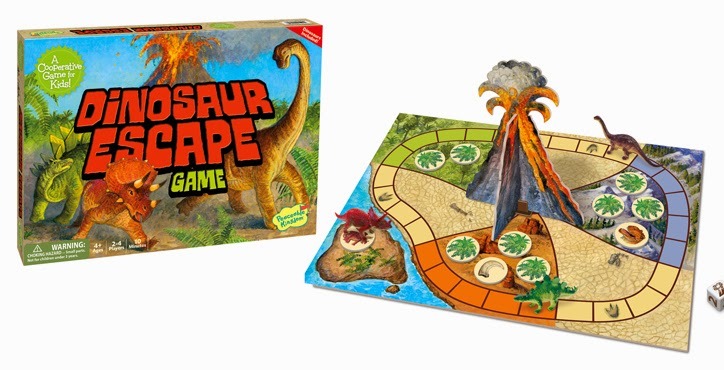 One winner will Receive a Dinosaur Escape Cooperative Board Game! The dinosaur matching and puzzle is great. My 3 year old LOVES matching, and dinosaurs! My oldest child really likes board games (he's 4), and I'm sure he would love Hoot Owl Hoot! I think my grandsons would also enjoy the Sunny Day Pond game! I would love the Password Required Lock & Key Diary for my son! All 3 of my kids love playing board games! The Fish Stix Board game looks so fun! My daughter loves games! I'd like the hoot owl hoot to play with my family. We all love board games. My daughter loves board games and would like the dinosaur one the best. Our whole family loves board games. I like their Fish Stixx game. My kids would like the Build It! Sticker Activity Book. Hoot owl hoot looks fun! I like the Princess Match Up Game & Puzzle. We all like board games here! My whole family loves board games, I think Noodle Speedoodle sounds like a fun one. I love Princess Match Up Game & Puzzle and my kids love board games! We are very bee friendly in this house so BUZZ looks like a lot of fun! My whole family loves board games! They make family time lots of fun! Hoot Owl Hoot for my owl lover. I visited and maybe Fish Stix. my son would love the dinosaur matchup puzzle!! My daughters would love the Password Required Lock & Key Diary. My sons love board games. I think Race to the Treasure looks fun! My sons both like board games. We do too! My kids and my husband and I all love board and card games! We have so much fun playing them...especially during the summer months. My son would love the Crazy Mates and Go Fish card games!